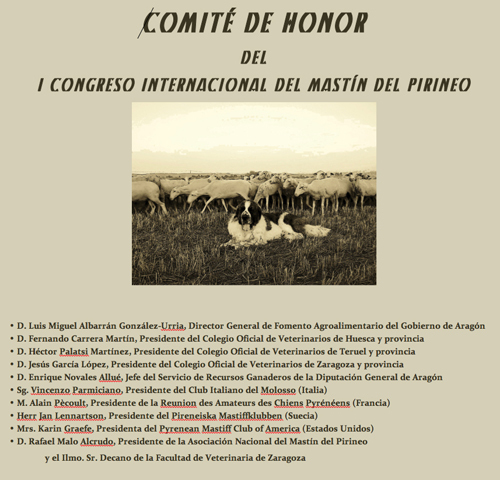 The congress program and honor committee for I Congreso Internacional Mastin Del Pirineo on May 16th - 17th 2015 focusing on the preservation of our breed. Doctor of Veterinary Medicine. 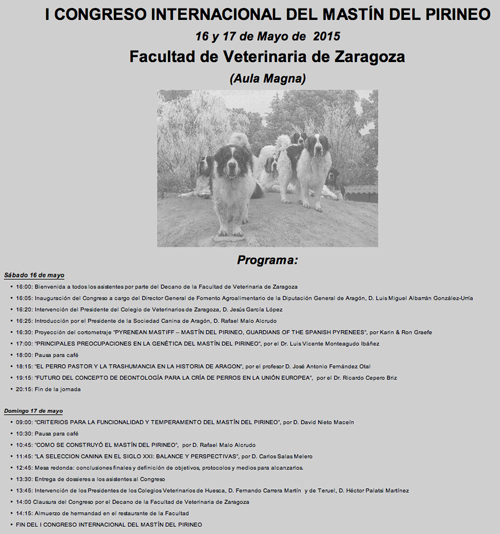 Professor of Animal production Department of the Faculty of Veterinary of Zaragoza. He is an authority, known and recognized internationally, in poultry. His specialty is focused on optimizing production protocols and the influence of animal welfare measures on the results of that. Spanish representative in the Scientific Working Groups No. 4 and 5 of the European Federation of the World's Poultry Science Association from 1992 to the present and regular speaker at more than 120 conferences and seminars on production and animal welfare, having written numerous work in all types of national and foreign scientific publications. Besides having directed numerous Bachelor Theses, Master Theses and Doctoral Thesis, has initiated numerous veterinarians in research techniques throughout the national territory, both in guiding their projects and facilitating scientific necessary documentation and contributing to its formation by facilitating access to certain techniques. In relation to the canine species, he teaches ethnology classes at the Faculty and collaborates since 1995 with the Canine Society of Aragon, having directed in 2006 the Doctoral Thesis of María Jose Cárcel Rubio "Caracterización y tipificación del Gos Rater Valenciá" on which had previously written the following works: “Estudio etnológico del Ratonero Valenciano “ (1998) and “Caracterización faneróptica del Gos Rater Valenciá " (2001). He was part of the team of the Faculty of Veterinary of Zaragoza at the end of the 70 classified, measured and recorded the initial individuals of Pyrenean Mastiff in collaboration with the Club del Mastín del Pirineo de España (CMPE), helping to draft the current breed standard. The professor of ethology David Nieto Maceín is an specialist in canine behavior, canine therapist and instructor for School Psychology, Techniques and Animals Arts and recognized by the General Council of Veterinary Colleges of Spain. He has devoted a lifetime to the study of the wolf both wild and semi-wild and has over 20 years experience in professional dog training in different branches. He has directed several dog schools and is advisor on wolf and dog ethology for different organizations in Sweden, Spain and South America, as well as veterinary practices, naturalists, researchers, zoos and many associations related canids in particular or the nature in general. Master in environmental education and conservation project manager, receiving personal recognition of Jane Goodall, the most prestigious global ethologist. In 2009 he was sent to West Africa by the Jane Goodall Institute Spain as project leader.Currently remains one of the most significant members of the same team, undisputed international ethology reference.David Nieto regularly gives seminars on animal behavior and is also author of numerous articles and reference books as "Ethology wolf and dog. Analysis and interpretation of their behavior" (2008 Tundra) and “Problemas de Perros, Perros con Problemas” (QVE 2011). "THE DOG SELECTION IN THE XXI CENTURY: BALANCE AND PERSPECTIVES"
Dogs have been the focus of his life, both personally and professionally. Breeder, Exhibitor, Trainer, Judge, Writer, Photographer and Editor of dog magazines. He started with hounds, which was linked since childhood by his family. In the late 70s worked as guard and defense dog Trainer and as a handler, getting his greatest triumphs achieving the Best in Show in the World Dog Show 1983 showing the Spanish Mastiff "Tigre"but also winning Best of Winners at the USA National Specialty of Yorkshire Terrier (Yorkshire Terrier Club of America) held in New York with "Torero de la Villa y Corte” or World Championship with “Huri de la Villa y Corte”, both bred by himself and his wife Ana, owners of one of the world reference affixes in this difficult breed. Internationally renowned photographer, his photographs have been published in dozens of books and journals. Studied and researched everything about the different dog breeds, their origins and development, he has worked assiduously in most existing publications in the sector in Spain since the late 70s. Editor and owner of "La Revista del Perro" worldwide most prestigious magazine along a decade, in addition to writing several books and several articles on canine subjects. In 1988 he collaborated in the introduction and spread of Agility in Spain, organizing the First Course Agility Monitors in our country. FCI Judge since 1990, one of the most internationally respected, specialist Yorkshire Terrier, Spanish Mastiff, Spanish Greyhound , Ibizan Hound, Schnauzers and Pointer. He is also judge for all the spanish breeds and more different breeds. He has judged in the major countries of Europe and in 2011 judged the Best in Show at the Spanish Kennel Club´s Centennial Commemoration Dog Show. Currently is a member of the Spanish Kennel Club Committee, Member of the Commission of Judges of the Spanish Kennel Club and Delegate for the Spanish Breeds by the Committee of the Spanish Kennel Club. "SHEPHERD DOG AND TRANSHUMANCE IN THE HISTORY OF ARAGON"
Graduate in Geography and History and PhD of Medieval History from the University of Zaragoza. PhD Prize of the University of Zaragoza. Lecturer and promoter of numerous projects to recover the cattle trails as well as the protection and recovery of agropastoral heritage of Aragon. Mountaineer and traveller from youth, in the 80s began to specialize in historical research of livestock and transhumance of Aragon, as well as everything related to its ethnographic and artistic heritage. He has published numerous articles and several books on our pastoral past (“La ganadería y la transhumancia en Aragón”, “La Sociedad Aragoneesa Medieval”, “La Casa de Ganaderos de Zaragoza en le Edad Media”, “La Casa de ramaders de Saragosa a l´Edat Mitjana”, “Transhumancia y fiscalidad medieval en el Alto Aragón”, “Las vías pecuarias y la ganadería transhumante de la Cinco Villas”, “La transhumancia en la Antigua Corona de Aragón”, “Los serranos de Albarracín y la transhumancia entre Aragón y Castilla en tiempos de crisis (1325)”, “La transhumancia entre el valle Medio del Ebro y el Moncayo a finales del siglo XV”) among many related transhumant livestock and Aragon.He has expanded studies at universities and research centers in Florence (Italy) and also in Grenoble and Paris (France). Currently focuses his research on the history of livestock in the Pyrenees and other European mountain ranges. 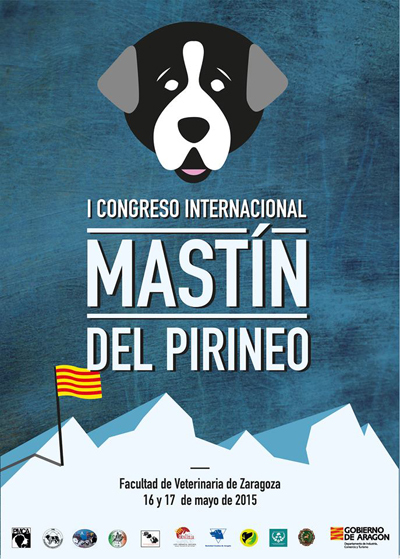 "THE MAKING OF THE PYRENEAN MASTIFF"
Founder in 1977 of the Club del Mastín del Pirineo de España (CMPE), the very first Spanish club dedicated to a national canine breed, in which he was Secretary General until 1985 and president until 2010. Currently Founder President. Breeder of Pyrenean Mastiffs from 1975-2009 under the affix "La Tajadera del Tío Roy" which, regardless of the number of championships won (over 170), forms the basis of practically all the Pyrenean Mastiff pedigrees worldwide. Founder and current Chairman of the Asociación Nacional del Mastín del Pirineo (Rolde Nazional do Mostín). Author or co-author of ten books about the Pyrenean Mastiff and/or another molossoid breeds, on which he has judged more than 160 national Specialty Shows as well as giving regularly technical seminars about those breeds all over the five continents. All breeds FCI international judge, having judged almost one thousand exhibitions in over 60 countries, including 12 World Dog Shows and 11 European Dog Shows. President of the Canine Society of Aragon. Current member of the Commission of Spanish Breeds and Commission of Judges of the Spanish Kennel Club.